World Streets: The Politics of Transport in Cities: Bad News Dept: “Manual for Streets” ignored in Wales. 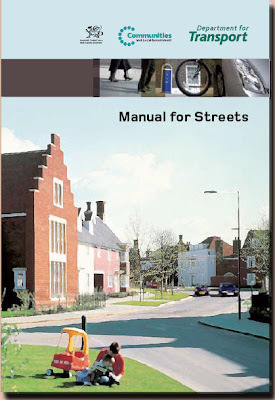 Bad News Dept: “Manual for Streets” ignored in Wales. “The Department’s policy-making process received an award recently, with Traffic Management Division winning a Royal Town Planning Institute prize for its Manual for Streets. The award recognizes that it is radically changing designers' and local authorities' approach to residential street design for the better. It emphasizes that streets should be places in which people want to live and spend time in, and are not just transport corridors. In particular, it aims to reduce the impact of vehicles on residential streets by asking practitioners to plan street design intelligently and proactively, and gives a high priority to the needs of pedestrians, cyclists and users of public transport.” – From the Dft project website (below). Yes but when you get to the street in Wales here is what you see (Ian Perry reporting from Cardiff). . .
Only one person out of the 20 people in attendance at a presentation on the Manual for Streets organized by the Chartered Institute of Logistics and Transport, held in the council offices of Cardiff Council, worked for a Local Authority (and not Cardiff), with the remainder working in the private sector as engineers or consultants – who reported that private developers were interested in applying the findings of the research into Manual for Streets, but wary of Local Authorities refusing to adopt streets. It would seem that the public sector in Wales is not interested in embracing different practices. Editor’s note: We strongly invite commentary and if available further information on lessons to be learned from this experience. Not having ever been to the UK, I don't really know how things work there, but the diffusion of innovation process takes awhile, and more than two years. How well developed are the workshops? How well developed is the communication process (i.e., see the work on "social marketing" and such tomes as _Strategic Marketing for Nonprofit Organizations_)? E.g., in part to increase demand for local authorities to pay attention to urban design, the citizens have to be knowledgeable and demand the local authorities be responsive. Many years ago I came across this UK initiative: http://www.helm.org.uk/, to provide guidance and assistance to local authorities on "historic environment and local management" issues. Maybe that's a model for you. The academic study of the innovation diffusion process in the United States came about because of the agricultural extension program, created in the 1860s. In fact, the field of community development is derived from ag. extension (rural community development)--at least in the U.S.
Now you can read Malcolm Gladwell's _The Tipping Point_, but before you do, instead I highly recommend the original integrative work, which was expanded into the classic, _Diffusion of Innovations_ by Everett Rogers. (and there are lots of hits to this work from a google search). Also note the issue with automobility. Not to mention the issue between traffic and civil engineers vs. urban design. Publications such as the one you mention, have been published in the U..S. for at least the last ten years (this book from Oregon is about 10 years old: Main Street: When a Highway Runs Through It, there are equivalent publications from highway depts, in Maryland and New Jersey). Places advocates would argue that it is still a hard slog today... that little progress has been made. Automobility as a paradigm is hard to turn around in 2 years. It's had about 100 years to become inculcated. And making the roads safe for automobiles has shaped the entire profession of civil engineering and road building.